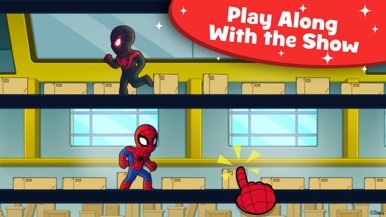 Help Spidey & Miles Morales stop Doc Ock – and catch a runaway kitty on a runaway drone! 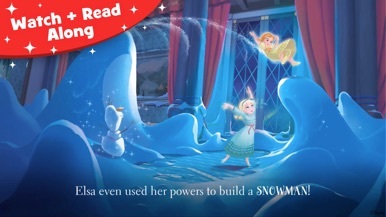 PLUS 10 new Read-Along eBooks, including new Marvel Super Hero Adventures books. 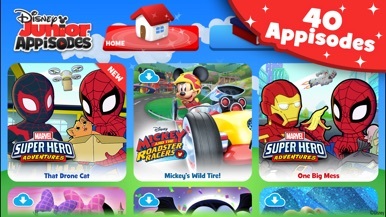 Disney Junior Appisodes will entertain, engage, and enrich preschoolers with interactive shows and books featuring all your favorite Disney, Pixar, and Marvel friends. 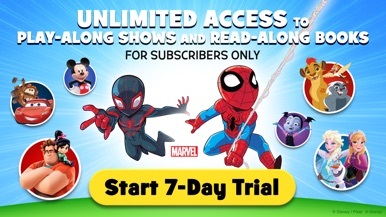 • Start your FREE trial today! 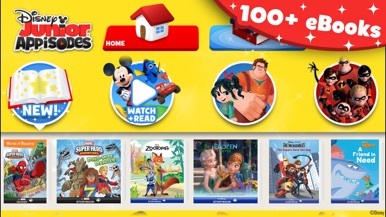 Ralph Breaks the Internet, Wreck-It Ralph, Mickey Mouse, Minnie Mouse, Marvel Super Hero Adventures, Ant-Man and the Wasp, Avengers, The Incredibles, Disney Princess (Belle from Beauty and the Beast, Ariel from The Little Mermaid, Aurora from Sleeping Beauty, Mulan, Tiana, Merida from Brave, Cinderella, Snow White, Pocahontas, Jasmine from Aladdin), Disney Fairies like Tinkerbell, Elsa and Anna from Frozen, Coco, Lightning McQueen from Cars, Planes, Woody and Buzz Lightyear from Toy Story, Finding Dory, Moana, Monsters Inc., and many more. New books added every month! 100+ Read-aloud ebooks. New books every month. New Watch+Read motion book every month. Your iTunes account will be charged $2.99/month when your 7-day free trial ends. Cancel anytime in iTunes Settings / Subscriptions / Manage. Your subscription renews monthly. To avoid auto-renew charges, cancel at least 24 hours before the free trial or current billing period ends. Account will be charged for renewal within 24-hours prior to the end of the current period, $2.99/month. Malaysia, Philippines, Thailand, Indonesia, Vietnam ONLY: Your iTunes account will be charged $1.99/month when your 7-day free trial ends. Your subscription renews monthly. To avoid auto-renew charges, cancel at least 24 hours before the free trial or current billing period ends. Before you download this experience, please consider that this app contains in-app purchases that cost real money. Home Office Design Ideas is a great collection with the most interesting photos and info. You can find details and great photos. Main features: - Beautiful photos and info - Quiz games - Compare - Gallery slideshow - Bookmarks - Share and save photos - Real time availability, no internet connection needed Check out some great screenshots below. Motorcycles Collection is a great collection with the most beautiful photos and with interesting detailed info. Features: - Amazing photos and detailed info. - Search database - Save to favorites - Fun puzzle game - No internet needed Great for kids, enthusiasts and also for experts.